Good job Christine wasn't with me today. She would have been somewhat annoyed. I knew it was going to be a long day but no where near as long as it turned out to be. I got both the length of the walk wrong and the amount of climb. The 4 passes I had to cross must have amounted to at least 2,000 metres of ascent. As usual I got to where I wanted but it took 12 hours! The first pass was immediately to the east of Salamon where I stayed last night. The sun was just coming up as I reached the top and to get a better view I climbed up the cliff next to the trail. The views were amazing. In the east I could see Peña Espigüette - the second highest mountain in the Cantabrian range (2451 metres) and, because of its near perfect shape, the most iconic. One side of the pass the valley was full of mist while the other was clear and in bright sunshine. At La Salas, the village at the bottom of the valley, a bar was serving coffee. I was tempted to stop but I was already getting nervous about time and resisted. I crossed the bridge, and followed the path which ran next to the river. After a kilometre or so a huge wall, a dam, loomed up on the other side of the valley. In Spain, where there is a river there is nearly always a dam. The path carries on up the valley but the river which had been about 20 metres across is now just a little stream. 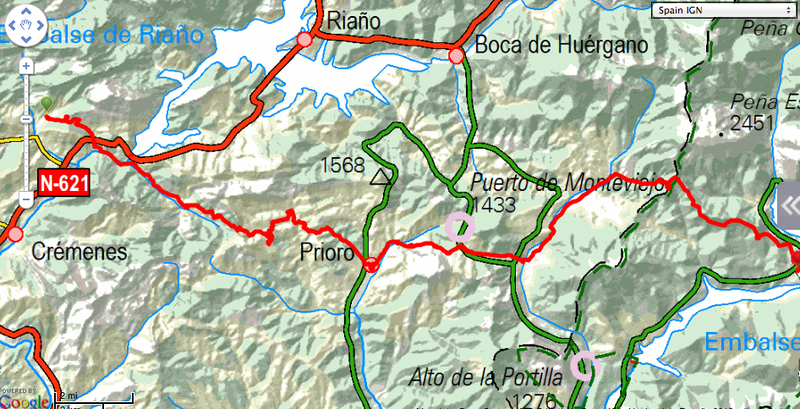 After another kilometre the path crosses the stream and dumps you onto a road which you follow for 3 kilometres to Remolina. Things get better after Remolina (nothing to stay for). You leave the road turning left at the fountain and climb up a shaded dirt trail. Glimpsing through the trees across the valley the views of the limestone cliffs on the other side are wonderful. The climb to the top and the pass, the Collada de Mostagerosa, is nearly 500 metres. It was hard to follow the signs down the hill and the route was much longer than anticipated taking a very roundabout path to the village of Tejerina. It's Friday but the locals seem to be preparing for a festival. Whatever they're doing they were not feeding a walker, despite the fact that it's 5 hours since he had had his breakfast. Better luck an hour later in a cafe in Prioro. Two shandies and a mega ham sandwich later, I'm refueled but ominously my GPS is telling me that I'm still the wrong side of half way. There is accommodation in Prioro and if it had been obvious where it was I would have stopped; but it wasn't and looking for a hotel at 2 in afternoon didn't feel right. Onwards and upwards and pass number three. Walking up through the valley it was hot and sticky, the way markings were few and far between, and I didn't want to lose any time on the wrong track. There was only one way to go however and it was up. On the other side of the pass all you had to do was follow the narrow country road down to the village of Besanda which sits at the bottom of a much wider valley. After walking north along the valley for a couple of kilometres the path turn east again and directly ahead is the village of Valverde de la Sierra, which sits almost underneath Peña Espigüette - a great view. By the time I got to Valverde de la Sierra the heat has gone out of the day and it was much cooler. The light was fantastic and altogether it was perfect evening for walking. 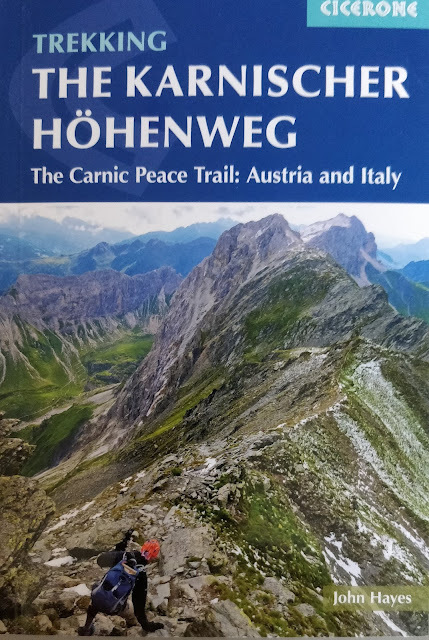 The walk takes you up a lovely valley and ahead of me I saw a fox running across the trail. Further ahead still was a flock of sheep coming down the side of the mountain marshalled entirely by the huge Spanish sheep dogs you see everywhere in northern Spain. These dogs are massive, similar in scale to a St Bernard but perhaps slightly lighter. They have been bred to kill wolves. They were five of them and as I walked past they did start to bark at me so I didn't hang about asking to them pose for a picture. The last pass, on the southern flank of Peña Espigüette, was the biggest and best of the day. Once get to the top there is a long contour walk with great views of the mountain before you start your final descent down to Camporredonda de Alba. Given the wonderful weather it was the very best place to be. 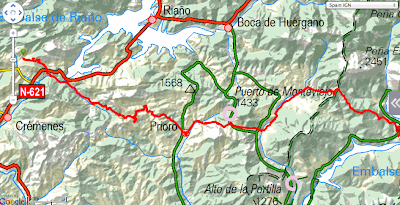 There are two hostal/hotels in Camporredonda de Alba and I stayed in the same one I stayed in last time with Juan. It was busy, someone was celebrating a 25th wedding anniversary with a big family dinner, but they were more than happy to put me up and provide me with food. As usual I was the first person to sit down and after a 47 kilometre walk all I wanted to do was eat and go to bed.